The Form.Close() method of WinForms is used to post the WM_CLOSE message to the message loop. This message causes a sequence of events to occur that can end in the window closing; assuming no other event cancels the process. This has been standard Windows behavior since version 1.0.
thread the code thread will always run each event to completion before executing a new block of code. 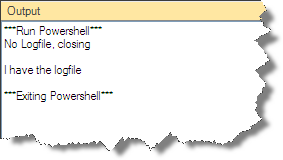 As David has pointed out the PowerShell script block will always run to completion BEFORE the message loop will be allowed to process the WM_CLOSE message. This should be true of nearly every ‘Form’ method. Windows is and has always been an event driven environment. Nearly all methods do no more than “queue” an event. Every executing event will always be guaranteed to complete before a new event will be scheduled. The rules of event scheduling and Message Loop message handling will determine whether an event can be pre-empted by a newly scheduled event. Only unscheduled events can be preempted or reordered. This is all good to know as it can be helpful in understanding much of the behavior of Windows Forms code in PowerShell or any other language.